I’m in the midst of a terrible, horrible, no good, very bad day week, guys. The kind that makes you wonder why you even keep trying. One thing after another. I’m trying to get past all that so I’m not going into detail. 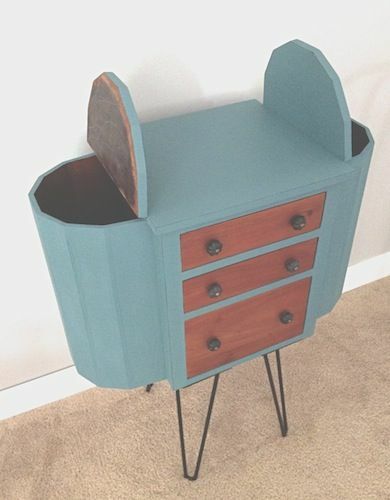 No, instead I’m back to share the two most recent milk painted pieces-the sewing cabinet (which is actually more of a side table than cabinet) and my mom’s former side table. The only pieces I have done a distressing technique on because I haven’t been the biggest fan. You’re reading the words of a changed woman though. 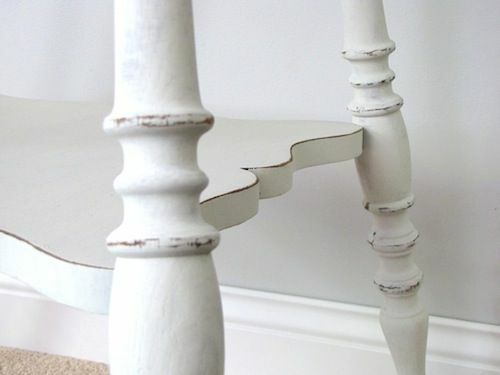 I will not be distressing every piece but on the right furniture, aging, distressing and chippiness add more character. 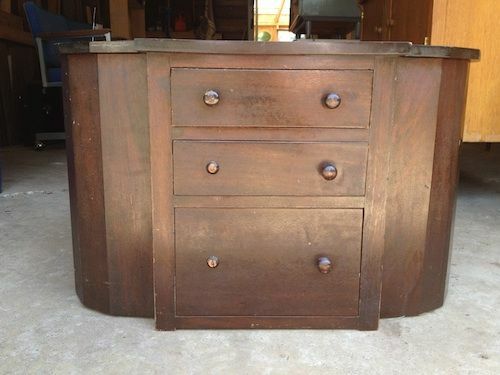 Plus milk paint kind of begs you to in my opinion. I don’t think I was too shabby at it. Or I was because this is a shabby chic/cottage/rustic look. 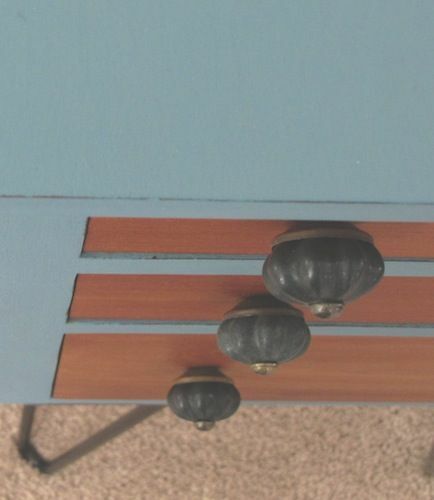 Even though there are hairpin legs on the sewing cabinet. As soon as I saw it last year at that barn sale with broken legs I knew what I wanted to do. I like mixing styles so it got a bit of a mid-century twist. I didn’t want such a traditional, stuffy look. The entire piece is made of walnut and had a very heavy dark reddish stain and a tough, shiny finish (not my favorite to remove) which took some Soy Gel stripping action to get off…or mostly off. Stubborn thing. I also sanded with my orbital sander and some coarse paper. Painting was the fastest and easiest portion of the project. I knew I wanted some iron looking hardware and finally found some smaller scale knobs from Hobby Lobby. It finally all came together. The sides flip up and provide deep storage compartments. I really wanted to find an old umbrella and stage my pics with it but that didn’t work out. 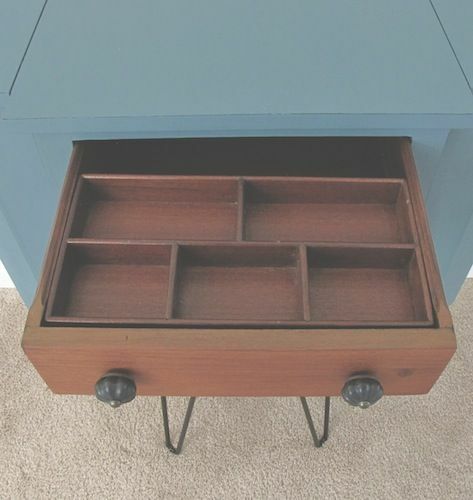 The top drawer has a removable compartment for thread or whatever since this doesn’t have to be for sewing. 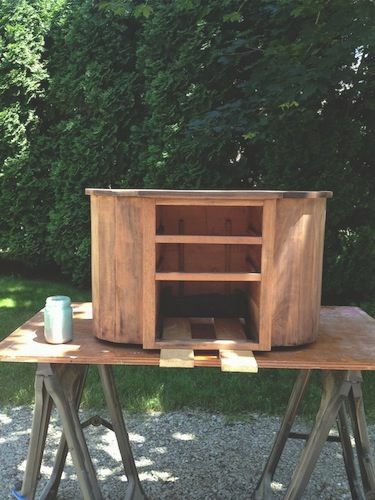 The only part I was unsure of was whether or not to paint the drawer fronts but, in the end I wanted a more rustic feel so they just got a few coats of hemp oil. I must admit I did not intend for it to be this color and while my pics make it look pastel, it’s a rich turquoise. My original aim was sage green to go with the natural drawer fronts. I love what I ended up with though. 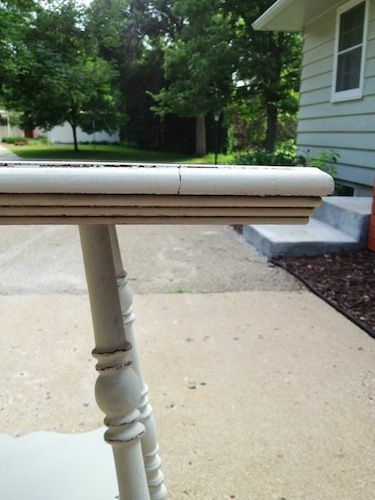 After a few repairs to my mom’s old table and an in-depth sanding session later, it was ready for paint. 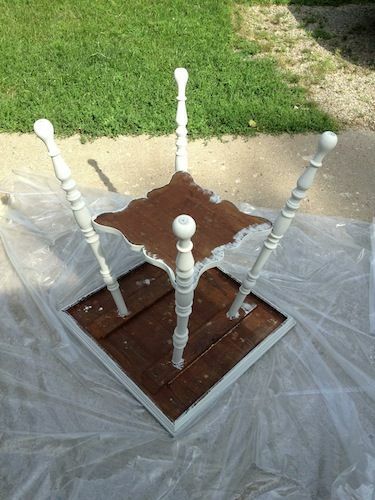 I tend to do a normal first coat when it comes to milk paint. Using the suggested ratio of powder and water then the second coat is more of a glaze (depending on how the first coat dries) with more water. I end up with an even look this way and again, it depends on your surface and since mine is typically raw wood I don’t have many problems with evenness. There were some great chippy spots that showed up naturally that I adore. 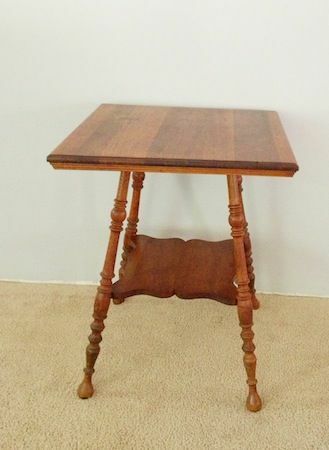 It took a few hours to get the distressing finished with those spindle legs but I am also a newbie when it comes to the technique and didn’t want to get carried away so I often stepped back to check my work. 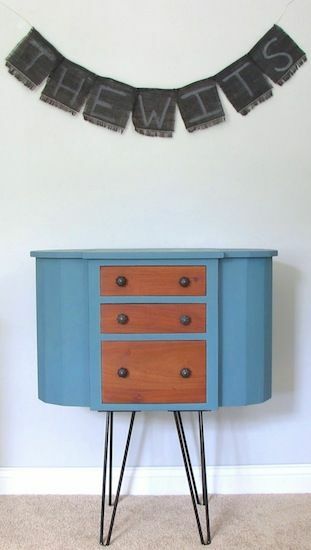 The sewing cabinet was painted using Miss Mustard Seed’s Kitchen Scale milk paint, a rich turquoise/aqua, and the side table is her Grain Sack, a neutral gray/cream/off-white. I have tried other milk paints but prefer hers after these last two projects. Wonderful stuff. Once you get it mixed (the tricky part since it comes in powder form and you mix it with water), it’s so easy to use and her colors are beautiful. You can mix the powders for a unique shade and since I now have 3 pouches of different milk paint in the fridge (cause that’s where I recommend keeping it) and another pouch on the way, I intend to mix my own colors. Just need more furniture…can you believe we’re out of pieces with all my collecting? I recommend mixing only what you need although covering your container of leftover paint and using it within a day or two is fine. I think it’s easier just mixing what you need though. We invested in a mixer that attaches to the drill which worked well until it came time to clean up and the clumps wouldn’t come off. Not sure I’ve found the ideal way to mix milk paint yet but I’m working on it. 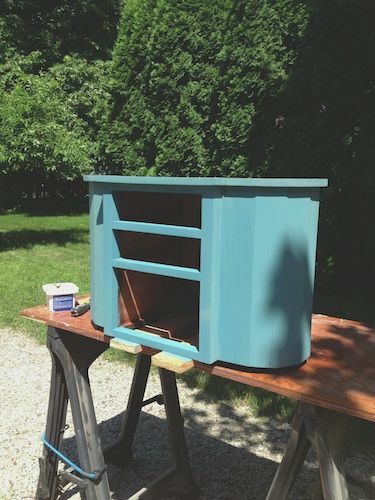 Milk paint has a mind of its own but provides a great matte finish. There are ways to cope with the varying issues like a bonding agent. I usually just sand my pieces very well to begin with, getting it down to raw wood, which helps the paint soak in and adhere. 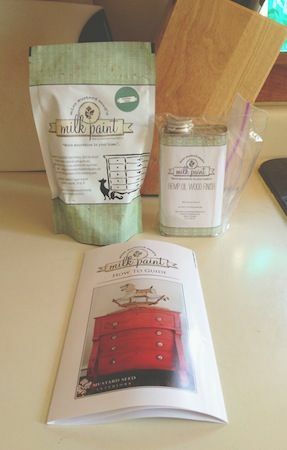 Want more info about milk paint, get it here from the queen herself, Miss Mustard Seed. On the side table, I also tried my hand with dark wax to accent the ridges. I mixed the dark wax (Annie Sloan’s wax) with the clear/light wax (Fiddes & Sons) then applied the brownish tone (what results) with my wax brush. I knew to be sure and have cloth nearby for wiping because it will stain your paint which is why you either first apply a clear wax, putting it where you want the dark wax, then the dark goes on top of the clear/light or mix the dark with the light wax and apply. Follow up by wiping the excess with your cloth. There are other options when using wax but that sounded the easiest to me. This tutorial from the Purple Painted Lady helped me out with the dark wax issue. Both tables were rubbed with 120 grit sand paper to distress those areas that would naturally have some wear then they were finished with a few coats of our new favorite finish, hemp oil. It’s natural and you just wipe it on with a cloth. You don’t have to worry about brush strokes. Awesome. 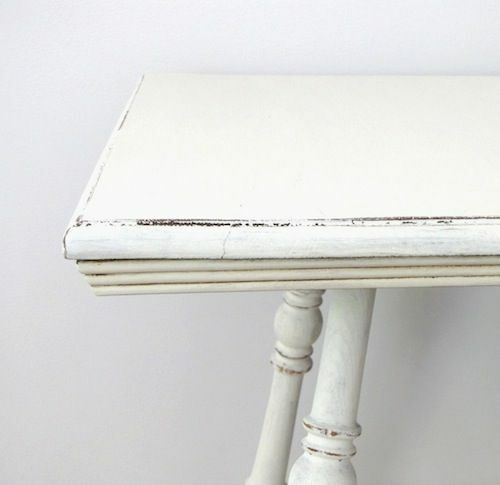 The oil just works so well with milk paint which must have a finish coat to protect the paint. 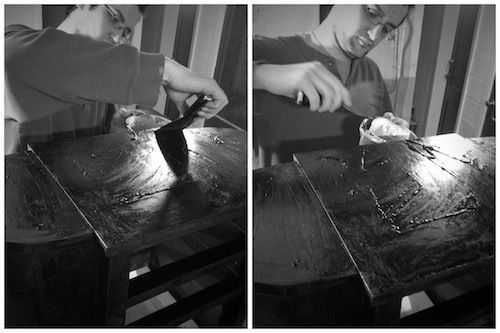 It will not cope with liquids until you have put a protective finish (wax, poly, oil, etc.) over it. 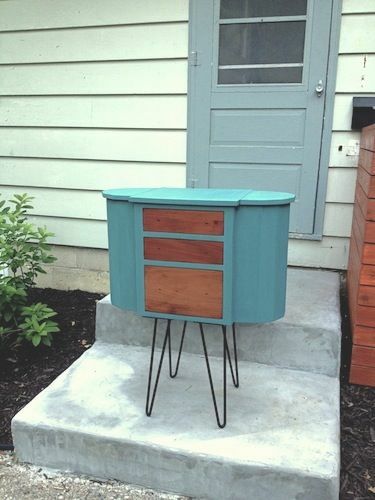 What are your thoughts on milk paint? What do you think of these two pieces? Both are in our etsy shop. I will be back to update you on the campaign dresser and faux campaign dresser later. 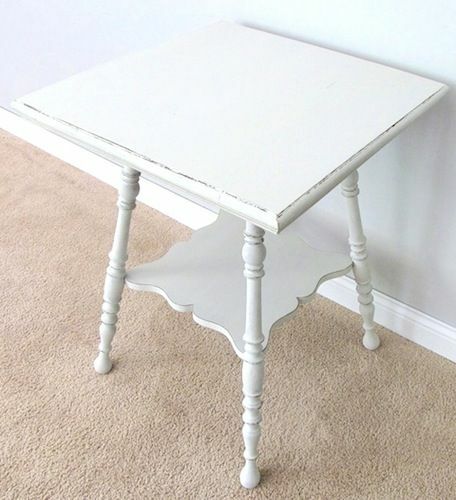 This entry was posted in Before and After, Milk Paint, Oils and Other Finishes, Paint, Tables, Tips and Tools and tagged chipping, dark wax, distressing, dresser, furniture, hemp oil, milk paint, Miss Mustard Seed, painting, table, wax, wood. Bookmark the permalink. I’m sorry about your week. Now that we’re facebook friends I have a bit of an idea of all the craziness you went through! Here’s to a much better weekend. 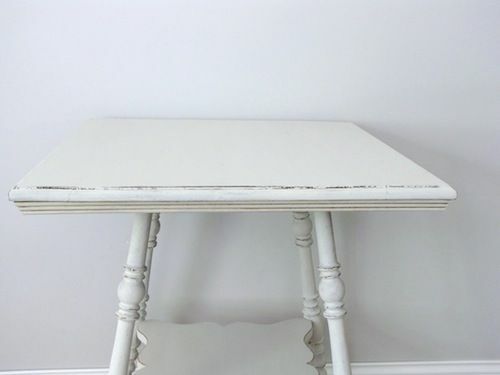 My mom uses chalk paint…is that similar to milk paint? She did most of Lucy’s nursery in it. These two pieces look lovely, my dear. Wish I could see them both in person! Thank you so much, sweet friend! It’s getting better with the seller feature on Krrb and Apartment Therapy. Then there was a forgotten rebate that came in the mail from our local hardware store so we can buy supplies to get more things done this weekend. In a time where finances are very tight, that was an amazing help and surprise. 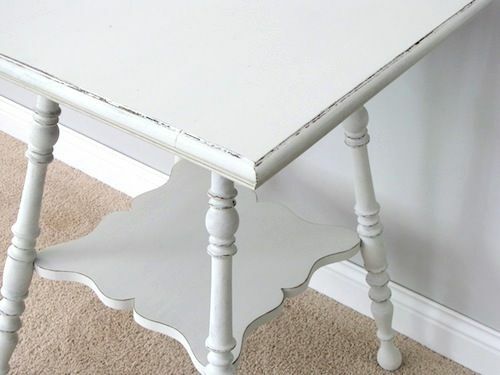 Chalk paint is similar to milk paint. They produce a similar finish and both need to be protected from liquids. 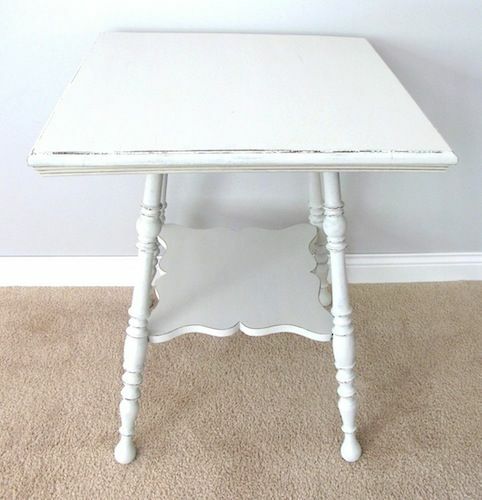 I love chalk paint as much as milk paint. We’ll be using it again soon. Lucy’s nursery is beautiful! Very well done. They both look so great, but I absolutely love that one with the hairpin legs…..it has such character! 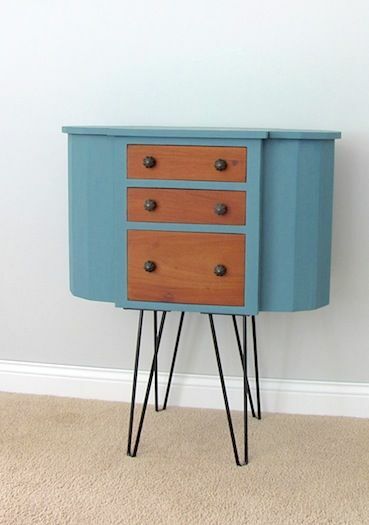 I’ve only used MMS Milk Paint once, but I did like it….but I am sort of with you on the chippiness….the pieces has to beg for it before I will give in. I tend to like a bit more a polished look. Thank you, Kelly. We are definitely on the same page! Hi there, Im just wondering how you got the “chippy” look naturally on the raw wood? Thanks so much. Beautiful work!! Thank you, Ashley! 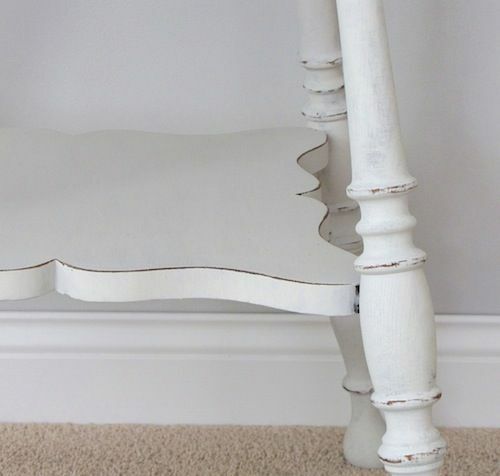 Milk paint has a mind of its own and is unpredictable. There are some ways to help chipping along though. I love using hemp oil as a resist to create chipping that didn’t happen naturally. Just apply it in the spots you want to see chipping, leave it on for maybe 5 minutes (also depends on how much chipping you want) then lightly wipe what hasn’t been absorbed away, add your paint then your finish coat(s). 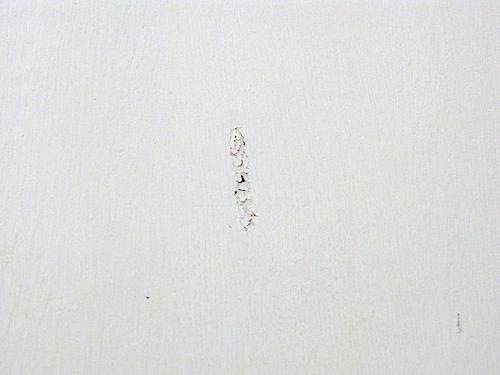 If you want more chipping than came out, do the resist technique again over your first coat then do another coat of paint. 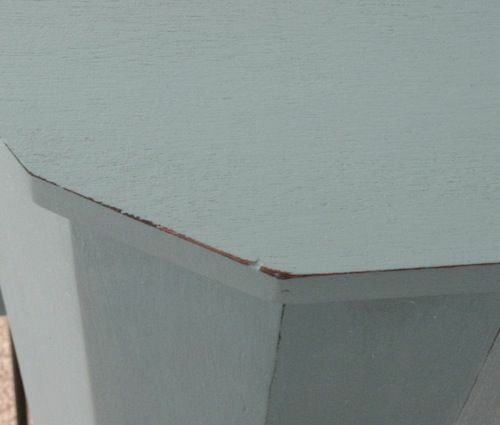 I usually do light coats when it comes to milk paint and use the technique between coats. 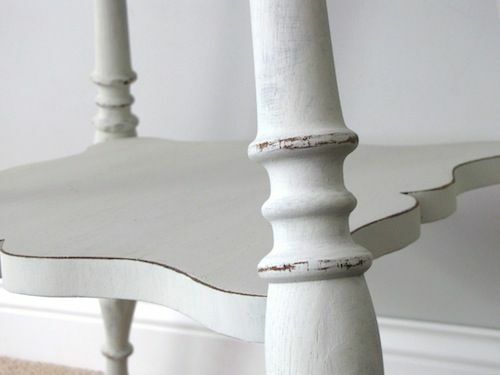 With varnish, it would most likely chip, but you will want to use the milk paint bonding agent that’s out (like Miss Mustard Seeds) over the top because there’s a good chance none of the paint will stick and it would all chip. If not immediately probably soon after. 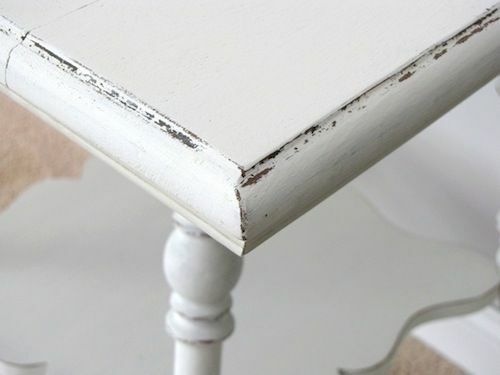 You could leave some spots of varnish on the piece like a resisting agent, sand the rest, then apply the milk paint, followed by your finish coat(s). It’s finicky paint, but user-friendly and adaptable. Not a problem! I enjoy helping. You wouldn’t need a bonding agent with a really good sanding. 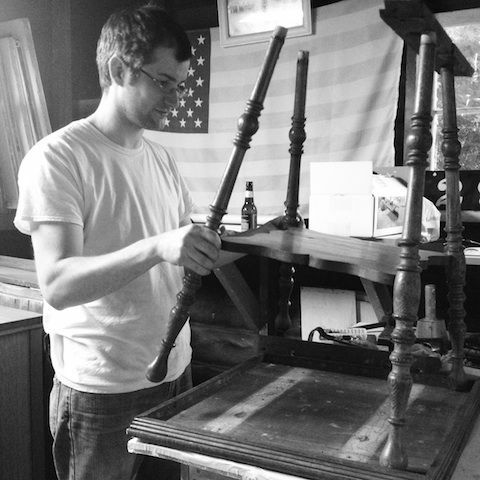 Then your wax or hemp oil resist, the milk paint and wax or poly finish and you should be good to go. You’ll have to share it with us when you finish!